I was recently contacted by Waitrose to offer me a little help with kicking any dietary bad habits and swapping naughty food choices for better choices in line with my 2015 health goals. I try and plan my meals and make nutritious and healthy choices in my diet, but like everyone, the odd takeaway, giant slab of Dairy Milk or bag of Kettle Chips does sneak in fairly frequently. They offered for their nutritionist to look over my weekly food consumption and suggest some tweaks to get me eating a little healthier. (They’ve also launched a great healthy food swaps tool on their website). She gave me three tips to switch up my diet and help me add extra vitamins, fibre, omega 3 fats and protein into my diet. Little changes can add up to a lot when you’re trying to improve food choices so I was definitely on board! I do intermittent fasting, so I usually don’t eat until lunchtime. I often then break the ‘fast’ with a lunch, whereas a lot of people find it easier to have three meals and start with a breakfast meal to add some nutrition and ease your metabolism in a bit more gently! Adding more fruit and yoghurt into my diet will also give me a boost of vitamins, good bacteria and protein. 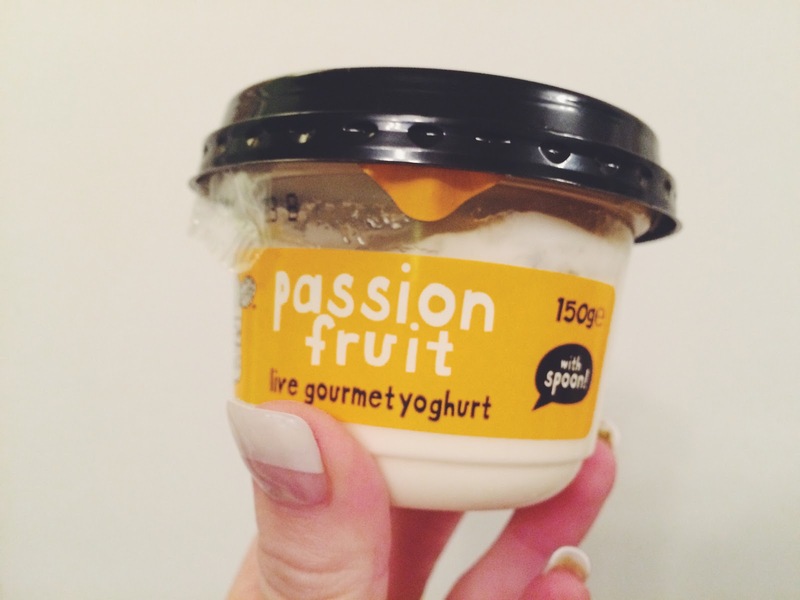 I am a bit obsessed with these Collective yoghurts, the passionfruit one is so yum! 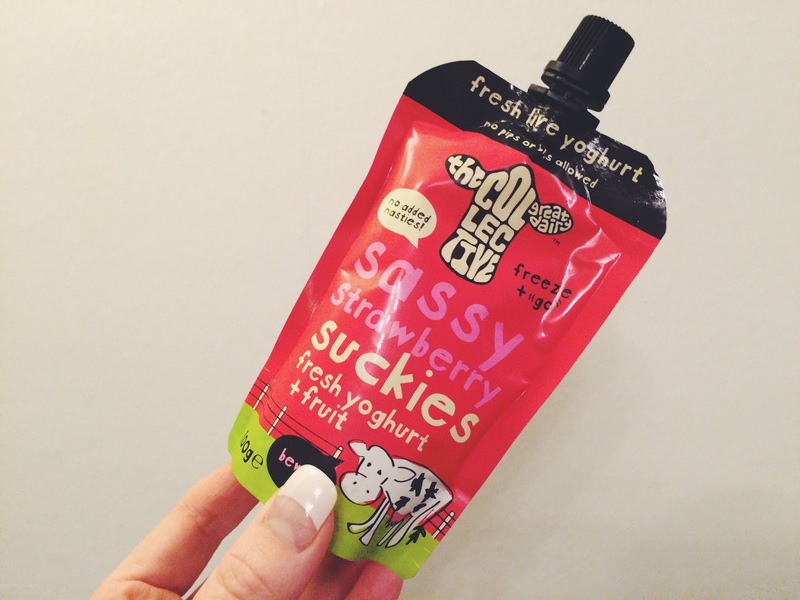 I also love their fruit and yoghurt ‘suckies’ – you can put them in the freezer and then pack them in your lunchbox and they’re all slushy when you go to drink them! (These are on offer in Waitrsoe for 66p at the moment). Pizza is my weakness and Dominos seem to text me more than my friends do at the moment. 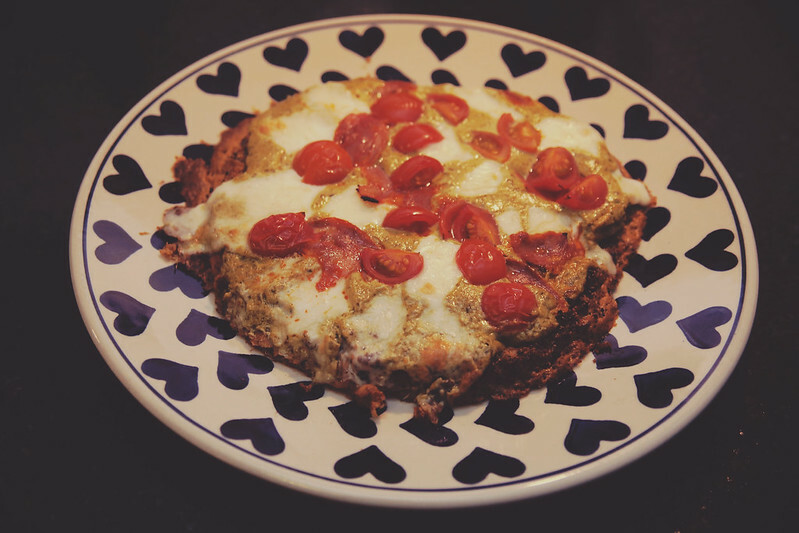 I decided to try a recipe for a healthy alternative to my favourite margherita pizza – using quinoa as a base. It might not look like the most presentable and ‘Pinterest’ of dinners, but trust me, it was SO good! I got the recipe from instagram but it worked a charm. The measurements are in cups but you can use an online converter if you don’t have a set of measuring cups. You can use whatever toppings you like – we added some shredded pepperoni – yum! I was also encouraged to swap two of my meals for portions of fish. 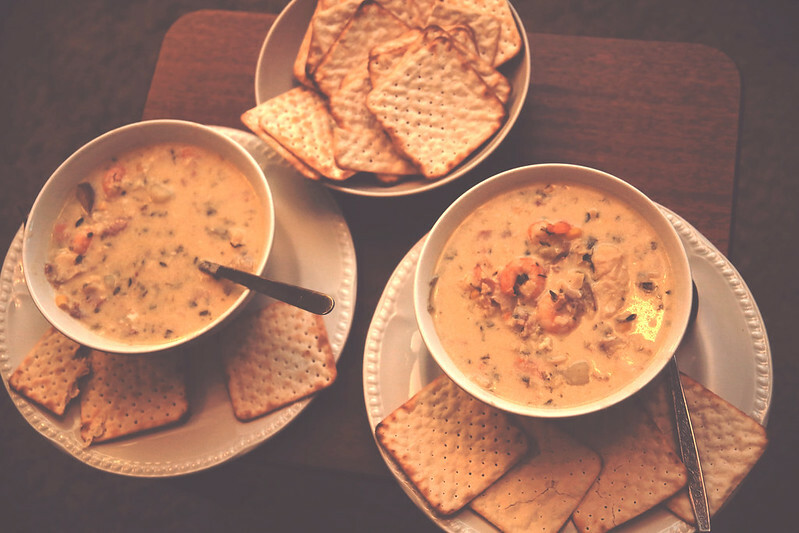 For one of these, we had Jamie Oliver’s recipe for Smoked Haddock and Corn Chowder. It’s a bit of a favourite of ours! You can watch the episode where he makes it on 30 Minute Meals here – or another blogger has posted the recipe here. It’s so chunky, filling and warming and the perfect chilly evening comfort dish. 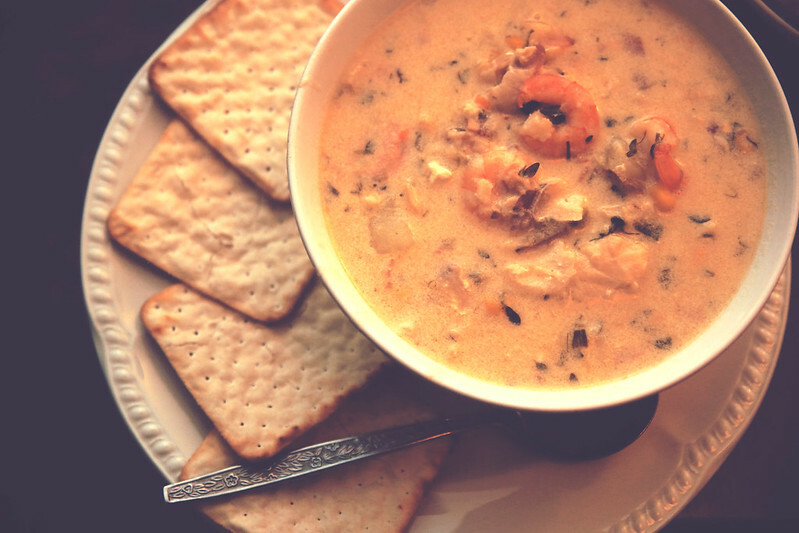 We serve it with Matzo crackers to use as a spoon for shovelling it in! I’ve really enjoyed these little tweaks to my diet and will definitely be eating more fruit and yoghurt, avoiding the takeways and including more fish in my diet. What could you swap in your diet to make a healthier choice? 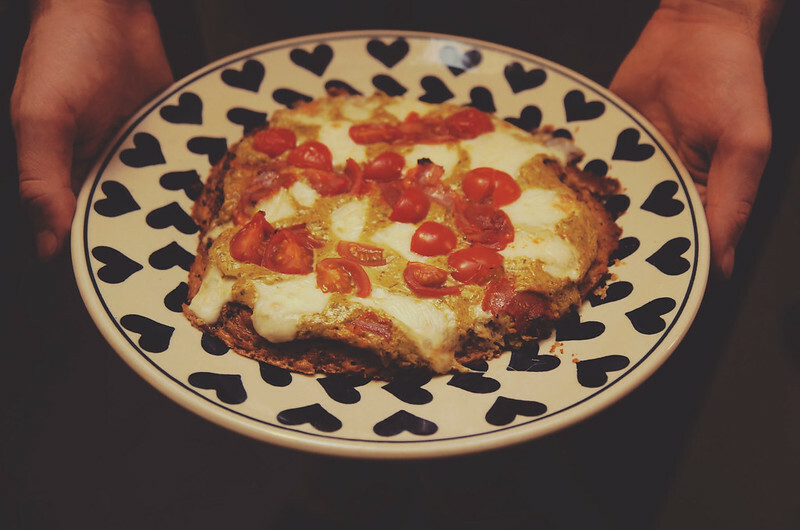 Have you tried any other healthy pizza recipes?